After a five-minute walk from Singeumho Station, the steep downward slope begins — how lucky was I to step out at Singeumho Station instead of taking Line 3 to Geumho Station, where I would have had to climb up instead of down! — and soon, an exceptionally new, two-story building dressed in gray hues and cotton candy pink stairs on its side arrests the eyes. 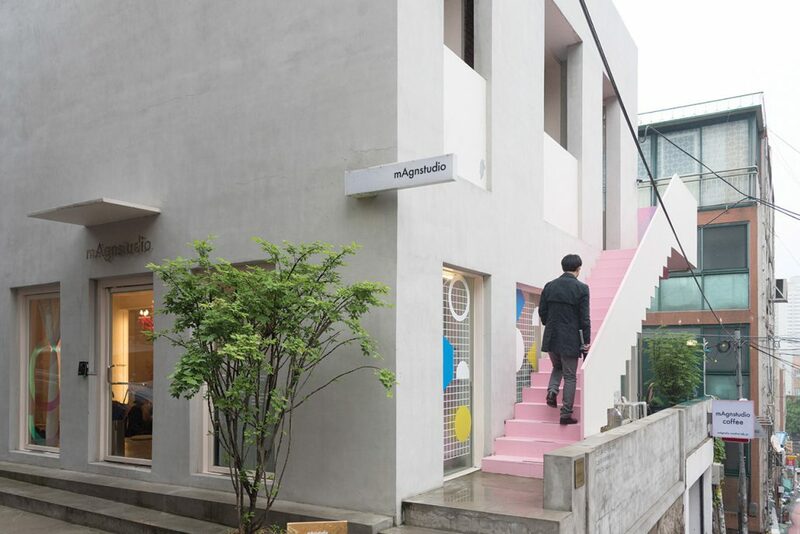 It’s in this enticing building that Dave Baik runs mAgnstudio — a comfortable neighborhood café in Geumho-dong where you can share ideas and make new friends. Inside, a fashion show video projected onto a wall hints of the concept behind the café. As the CEO of Magnolia Creative Lab, a fashion advertising agency, Baik values sharing ideas with others and wants to run a space of versatile use to connect people in and out of his business. Thanks to the small number of tables and chairs, the café can be easily transformed into a photo shoot location, for example. Most seats are around what Baik calls the “puddle” where colorful cushions are laid out in a circle. This area was inspired by how women did the washing in the past, says Baik. Wives washed clothes together around a brook, and they would share their troubles with others; various kinds of information were shared as well. In the café puddle, seats are designed to allow people to mingle freely with others by moving their seats as they like. A hot pink chandelier adorned with small objects hangs from the ceiling and signifies the identity of this café and its visitors. When Baik first imported the chandelier, there were no decorations. He and his staff decorated the chandelier with small toys from childhood. 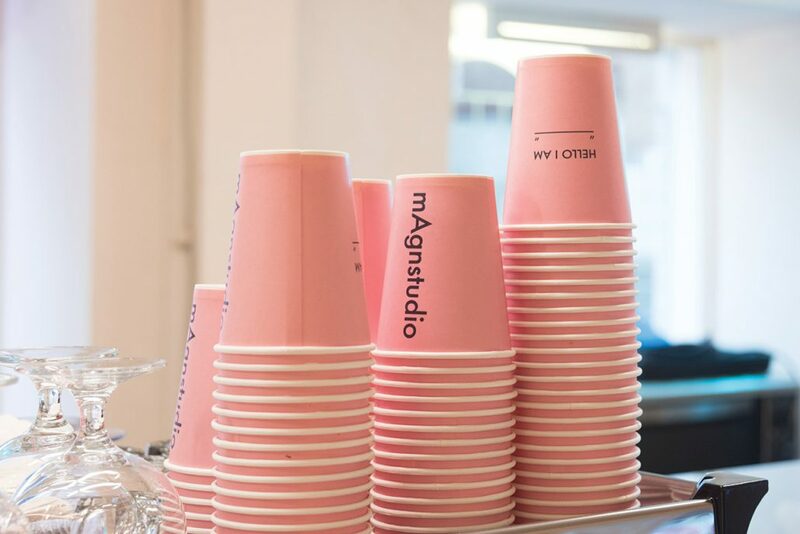 Pink was also the color in vogue when he opened in December 2016. “As you can see, the chandelier attracts the most attention. The chandelier is a symbol of different ideas converging here, and I hope that each person who comes here can also share in the same experience,” says Baik. Three menu items stand out at the café. 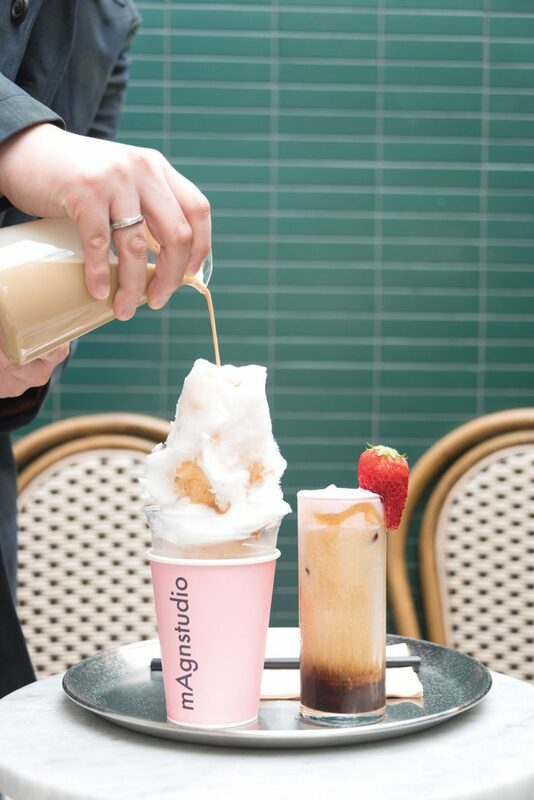 Geumho Hill, also known as a cotton candy latte, is made of fluffy cotton candy that’s melted down by trickling coffee over the top. It’s a sweet thank you to those who make the effort to walk up the hill, says Baik. The recipe is a secret but there are other secrets that are often hidden in the coffee itself. Some request an engagement ring or a red rose be placed in the cotton candy before serving to a special someone. Pink Vienna is served with pink cream over hand-dripped coffee. Last but not least, the honey butter carrot cake with extra-creamy cream cheese frosting was so rich and tasty that I’d be willing to revisit this café — even if I had to climb up the hill. A revolving glass door leads you to the outside garden, another Instagram-worthy photo location at this café. The garden wall has been recently painted in green to correspond with fashion-color trends. But it won’t just be the colors that will continue to change with evolving fashion styles; all the details in the café will metamorphose along with it. The chandelier, however, will always remain bright pink as the symbol of the café’s beginnings and mission. Tuesday to Sunday 10 a.m.–9 p.m.